As I watched the Olympics come to an end, and the inspirational adverts for the Paralympics filled the ad gaps, newspaper columns were expressing concern about the serious financial shortfall putting the event into jeopardy. The relationship between the Olympics and the Paralympics has never been easy. Up until 1988 they were totally separate events, and then after the Seoul games the IOC and IPC came to an agreement to hold the Games in the same cities and venues. Excellent move, but they remain uneasy bedfellows. The best example of this being the stance taken over the Russian doping scandal. The IOC sat on the fence and gave the responsibility of making decisions to the sports federations with 10 days to do it, an impossible situation for most of them. In contrast the IPC took a stand and banned the Russian team. This is not a reflection of more doping in the Paralympics, just the opposite. It’s a moral and political stance. It was also Phillip Craven’s, the President of the IPC, last few months in this position, so perhaps he felt freer to take the moral high ground. However, whilst the Paralympics may be the moral champion, it is the financial minnow in comparison to the Olympics, finding it harder to attract the lucrative financial sponsorship, drawn by the perfect bodies of the Olympians. Basically, the Rio local organising committee ran out of money and needed to find an extra £1.2m to cover the travel expenses of some athletes and officials. Initial lack of income resulting from only 12% advance ticket sales added to the crisis, even when most tickets cost less than $3. At less than a month out the Mayor of Rio declared it ‘would be a shame to cancel the event’, as if it was a local footie match. The IPC had already pumped additional funds into the games, and after some brinkmanship with the Brazilian Government passing legislation to put in no more funding, more grants were found. Whilst in the background allegations were made that money meant for the Paralympics were spent on last minute crisis solutions for the Olympics. Pledges were made to bail out the games, but such concerns exist about the transparency of the financing that a Brazilian federal judge forbade the authorities to transfer public funds to the Rio 2016 organising committee until they opened their books. Phillip Craven was driven to issue a press statement saying that cuts to transport, media, changes in venues and the programme were going to have to be made. The London Paralympics was regarded as one of the most successful since Sydney in 2000, when funding per para-athlete matched that of Olympians. What actually happened was that the Rio Paralympics was a huge success. Whilst stadiums were not always full, the Brazilian enthusiasm filled the additional space. After an advance advertising campaign posted freely by the largest national cinema group, showing inspirational profiles of Brazilian para-athletes, each seemed to be known personally to the crowds and cheered on as established national heroes. Whilst speaking to the IPC and other officials it was clear that behind the scenes the analogy of ducks paddling wildly below a smooth surface came to mind, front of house it was a truly positive life changing experience. 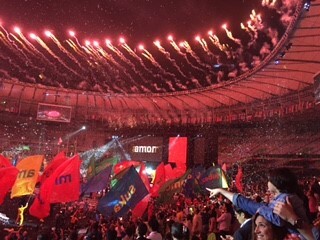 This was clearly endorsed by Sir Phillip Craven himself who at the closing ceremony called the Games “uniquely Brazilian and wondrous” and bestowed the Paralympic Order, the IPC honour, on the Brazilian city and its people. I wonder what Tokyo holds?